Are you visiting the island with a group of friends, family or coworkers? Our pontoon boats fit up to 12 people, making them a comfortable choice for hosting your on-the-water adventure. The boats’ low platforms make them accessible even for young children or individuals with some mobility issues. 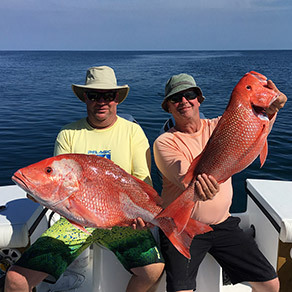 The waters surrounding Boca Grande are rich with sea life, making them a prime fishing location. Our center console fishing boats come equipped with all the bells and whistles to help you easily navigate the waterways and discover some of the best fishing spots in the area. You and your fishing buddies will be sure to have a blast. Boating is one of the Boca Grande’s most popular pastimes. Whether you’re a fishing enthusiast, pleasure cruiser or a nature lover, you’ll be sure to enjoy a day of exploring the waterways around Gasparilla Island. The clear, turquoise water of the Gulf of Mexico, Gasparilla Sound and Charlotte Harbor beckon residents and visitors alike to discover their natural treasures. Visit nearby islands only accessible by boat, like Palm/Don Pedro Island, Cayo Costa, Cabbage Key or several other unnamed islands just waiting to be explored. Watch playing dolphins, floating manatees and diving sea birds, or drop in a line and fish for Tarpon, Redfish, Cobia and more. Let your boating adventure begin! Rent a pontoon boat or center console fishing boat today. We have affordable daily, weekly and monthly rates. We’ll deliver your boat directly to your dock on Boca Grande for free with any rental three days or longer. Otherwise, our boats are docked at Cape Haze Marina on Placida Road, about a 15 minute drive from the Boca Grande Causeway, for convenient pick up. *with three-day rental or longer. 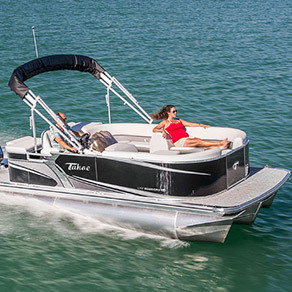 At Abe’s, we’re dedicated to providing a fun, care-free boating experience for our customers. That’s why we adhere to a strict standard of excellence when it comes to maintaining our fleet. Each of our rental boats are checked daily for proper operation, safety and condition. We’re proud to say that we have the most meticulously maintained rental fleet in the area. Have questions about renting a boat? Visit our Boat Rental FAQ or call us at 941-662-9639.